After several years of traveling into Mexico in search of bromeliads, and seeing the changes which have occurred in the span of a few short years, we have begun to ponder what will become of the bromeliads and the other unique plants as "progress" spreads to the far corners of Latin America? Since we have not traveled in bromeliad countries other than the U. S. and Mexico, we know of the Central and South American habitats only from what we have read or heard, but the story seems to be rather uniform, except that Mexico may be a bit more progressive than most. When we began promoting bromeliad growing as a hobby several years ago, very few people in South Texas even knew what a bromeliad was and very seldom could they be found for sale here with the exception of a few commercial varieties. Now, on occasion, one can see bromeliads, literally by the truck load, at importers of Mexican plants. At these dealers or at the border we have seen thousands, even hundreds of thousands of bromeliads freshly stripped from the Mexican forests. Very often the bulk of these plants are mature, blooming or spiking Tillandsia deppeana and T. imperialis, spectacular plants selected for their showy blooms and sales appeal, species which will not adapt to Texas' hot sea level climate, especially in the hands of an inexperienced novice who may never have seen, much less grown, a bromeliad before. Very likely most of these plants will soon perish. In fact a visit to one of these importers a few months after the shipment is received will reveal huge numbers of dead or dying plants. These Mexican bromeliads have become so popular that college-age youngsters often offer them in their booths at the flea-market in downtown Austin, Texas. Some have even gone so far as to form import companies to bring bromeliads into Texas by the van full. Importing bromeliads has become quite popular with import establishments popping up all over the country. To this surge of commercial collecting of bromeliads we must also add the ever increasing numbers of amateur or hobby collectors who go into Mexico to bring out plants for their own collections or for an occasional sale to finance their trip. Just seeing so many plants being brought out of the wilds by collectors on such a large and regular basis has often made us wonder how long this could go on before someone put a stop to it, or the supply of plants became exhausted. Our most recent trip into Mexico last June and July has changed our perspective on this subject somewhat. To our relief there are still many areas so densely inhabited by bromeliads as to be breathtakingly unbelievable, even when we were seeing the same sight for the third or fourth time. There are, however, areas that have been thoroughly stripped by large scale commercial collectors. While such examples are sickening, it is equally disquieting to find a familiar habitat which has been turned into a corn field. After all, people do need to eat and bromeliads are not edible. The loss of habitat seems to be the most pressing danger to the survival of the bromeliads, as well as to the many other species of plants and animals. The practice of slash and burn to clear the land is predominate in most Latin American countries, and as trees are cut to make way for agriculture and the land burned off, the habitats of these highly specialized plants are lost and populations, or even entire species are wiped out. There are groups working to rescue these plants in some limited areas in Mexico, for instance, the Council for the Protection of Nature of the State of Chiapas. This organization has not only undertaken a very energetic program of education but has constructed sheds for cultivating plants, including bromeliads, orchids, ferns, etc. which have been rescued from destruction in the necessary clearing of the forests and jungles. They also have a center for re-planting these rescued plants into protected areas. These numerous State and National parks will offer protection for the species which inhabit those areas. But what of the thousands of species not so fortunate? Perhaps part of the answer lies in the propagation of these endangered species in collections. Orchids which have been declared endangered are often propagated by seed for distribution to collectors, taking the pressure off the wilds as a source of plants to supply the demands of hobby growers. On occasion these seedlings will be reintroduced into the wild in a protected area to form new populations. This approach could work very well for bromeliads too. 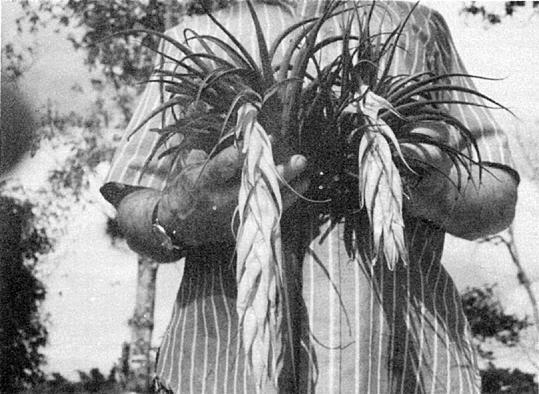 An example of this idea is Dr. Hal Wiedman's distribution of packets of seed, during the 25th Anniversary Conference, of Pitcairnia tabuliformis. This plant, quite rare in the wilds and practically unknown in cultivation, was recently relocated in Mexico by Dr. Wiedman. 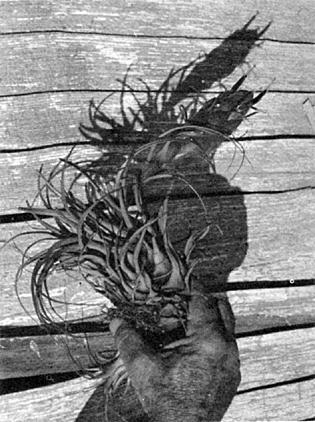 By collecting seeds and distributing them among as many bromeliad growers as possible, the demand for this plant can be met without depleting the small colony of plants discovered, a commendable action which I hope will be taken by other collectors who discover a species of bromeliad which has very limited distribution. While there are many factors in the survival of a species which are well beyond the control of a mere lover of bromeliads, we can do our best to see that we don't contribute to the extinction of even one species, and wouldn't it be rewarding to know that we were instrumental in keeping even a single species from following the dinosaurs, by distributing seeds or seedlings? Here I sit, in my wheelchair, sitting by the only window in my room at a nursing home. Many years ago, a friend brought me a plant called "The Queen's Tears," so I put it on the window with the rest of the plants. It thrived and bloomed. I was properly impressed, so I read about this plant and found that it was a bromeliad. So, I looked further into these amazing plants. I have a favorite plant company, and they offered two bromeliads, so I ordered them. They turned out to be "Earth Stars" (cryptanthus). The bloom on them was not interesting, but the leaves were very unusual and attractive, and I was intrigued by the method of reproduction. Many small "shoots" developed along the sides of the stem. They were easily removed and took to pot planting very well. Thus, the two plants quickly became 14. I soon discovered how adaptable and hardy they are, too. I keep my window open from the top all winter, as I like fresh air, and winters in Wisconsin can be brutally cold. I often forgot to water the plants, and misting was something that got done only once in a while. Often they were relegated to areas without light, and still they flourished. So I invested in other types of bromeliads, specifically a dyckia and several aechmeas, including a 'Foster's Favorite.' I have had them for two years now, but still no blooms. The dyckia is so lush and beautiful; I rather thought it would surely put forth a flower spike. But it did produce some offshoots, as did the others—now I just have to wait. 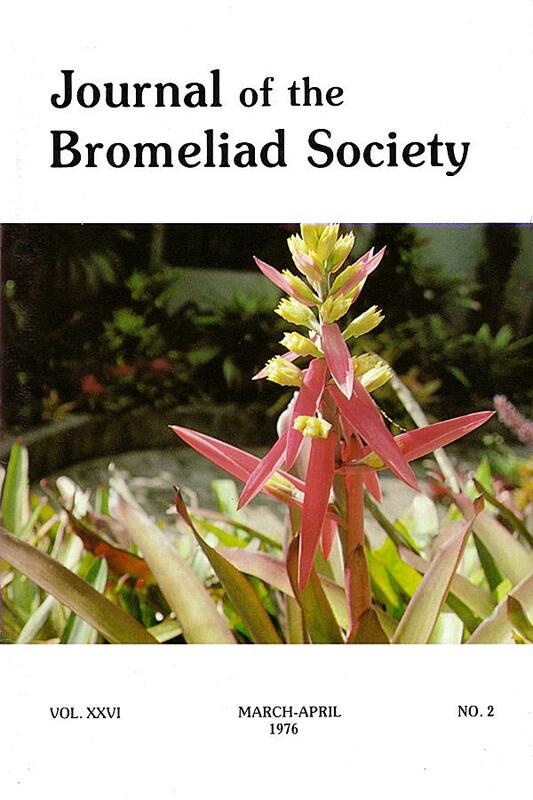 I joined the society to get more information about bromeliads. Most people who see the dyckia comment on how pretty my cactus is. I've long since stopped correcting them. So I sit here waiting for my bromeliads to put forth their exotic blooms. I look forward to the journal each month to see the beautiful pictures and read about the adventures of other members. But one of the latest issues really threw me. Someone had found two new species. Now there are two more to learn about. Over a number of years I have been intrigued by the horizontal markings of Guzmania lindenii in relation to the growth and elongation of the leaves. So far as I am aware, very little research, if any, has been carried out in the sphere of relationship between leaf growth and patterning of the leaves of bromeliads. 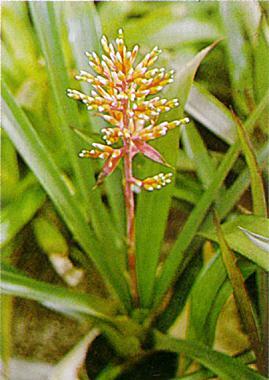 This relationship does not necessarily apply only to Guzmania lindenii but in my opinion could include that of certain vrieseas, aechmeas, and billbergias. My observations are not intended to be scientific but are those of a collector and grower of bromeliads over thirty or so years. G. lindenii has been a prime subject of my interest although at first this was not deliberate but was brought about by near enough daily inspection and maintenance of my plants which has produced an intimate knowledge of these subjects. The first fact that is accepted knowledge among plantsmen is that bromeliads in common with other plants do not grow at an even rate. They increase their size in a series of uneven growth rates. Indeed, these growth rates are most marked at two periods, during May and August, but even these periods are marked by uneven growth rates. Whether grown indoors or in the open plants are not only dependent upon light, heat, and humidity for their growth, but are also influenced by other sources such as ultra-violet rays, radio waves, electrical discharges, atmospheric pressure, and so on, and of course the length of day light is also a very important factor. G. lindenii is a beautiful bromeliad; its long narrow leaves are marked horizontally by a pattern of dark green wavy lines, and it is these wavy lines which have been the clue which prompts these notes. A cursory glance at the plant's leaves gives the impression that the patterning occurs haphazardly, but it is not so. This is what actually happens. Slowing down of the growth rate of the leaf (and naturally of the plant) does not affect the continued rate of formation of the wavy line patterning. During this time the patterning process continues at a normal rate so that the result is a condensing of the patterning causing a building up closely on the slow growing leaf until a more or less solid condensed band of wavy lines and dots is formed. When the slow leaf growth rate is released and growth is speeded up, a horizontal area of clear leaf emerges because the production of wavy lines has been used up during the slow growth period! No new formation of wavy lines will be made until the rate of leaf growth and formation of wavy lines are assimilated or balanced. It is my belief that in each leaf two separate but interdependent or inter-related functions exist; by this, I mean that the self color, the green base, if growing and elongating at an even pace would be patterned all over by a fairly evenly spaced display of horizontal lines and dots, but because of the leaf's uneven growth rate and the unhalted formation of patterning, the breaks in the patterning occur. The patterning cannot be manufactured quickly enough to catch up with the self color of the leaf. The metabolism of the plant must be undergoing very great stress having to accept the double functioning of the leaves, i.e. the movement of the leaves and the building up of the patterning. Thus it appears that the patterning is not controlled by the rate of leaf growth; it is continuing all the time whether the leaf is at rest or growing slowly. It is also my belief that the absorbent scales of bromeliads, such as with aechmeas and billbergias, are similarly interdependent or inter-related to give the banding effect peculiar to these plants. A morphological study of this fascinating sidelight of bromeliads is needed, the results of which may well open up a completely new way in which we breed and grow our favorite plants and bring about a new understanding of their ways of life. There is an old saying that goes, "Once the dust of Mexico has settled on your heart, you have no rest in any other land." This was certainly true with Jack and me, for after our trip to Baja and the West Coast in 1974, we could not wait to return. So on January 11, 1975 at 5:00 a.m., off we went, headed south, this time with a third traveling companion—Loran Whitelock. It was our intention to enter Mexico through Laredo, Texas. After clearing customs and our first experience with the well-known "Mordida", a few dollars to help us through, we were well on our way. Just past the city of Linares, off Route 60, we spotted Tillandsia schiedeana, T. recurvata, and T. usneoides. The weather was pleasant, approximately degrees at an altitude of approximately 2,200 feet. Our route was Highway 101, and we were heading toward Juamave. We saw several dions along the way and some small cyratazamias, but not too many interesting bromels. However, we did see the ever present T. schiedeana, ionantha, fasciculata, utriculata and catopsis species. We stayed in Tamazunchale one night, and the next morning we headed for Fortin de las Flores via Mexico City. At kilometer 110 outside Puebla at an elevation of 9,500 feet we spotted a beautiful tillandsia with red drooping spike—T. macdougallii, but we did not collect it as we knew we would be returning in the near future. We finally arrived in Fortin and put up at the Posada Loma, a perfectly beautiful place, with lovely gardens, excellent accommodations, and fine food geared to American tastes. The motel is owned by a Mrs. Alvarez, a most pleasant and friendly person. Our first venture was a short ride north of Fortin, toward the city of Hautusco—there are so many bromels in this area that one really cannot believe what he sees. In great abundance were T. ionantha, T. leiboldiana, T. punctulata, T. schiedeana, T. multicaulis, T. fasciculata, and many, many others. The elevation at Fortin is approximately 3,500 feet. 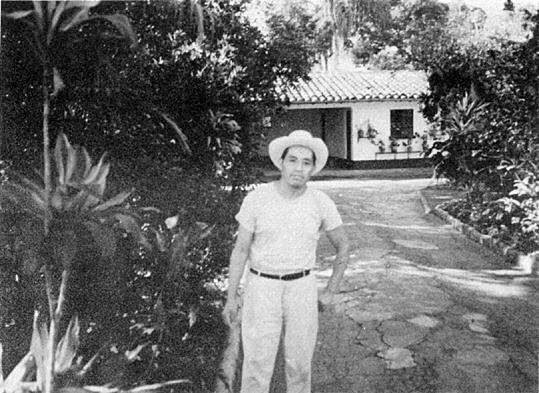 We made arrangements with Mrs. Alvarez to use her gardener, Domingo, to assist us in locating other bromeliads; we had heard that he could be of great help in locating certain species. 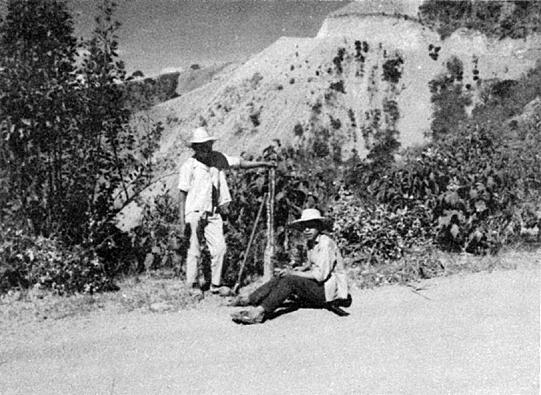 Our first area of collecting was Puerto de Aire, off route 150 on the old road to Mexico City via a very dangerous steep and curved road. At 8,500 feet and in super abundance we found T. imperialis and T. gymnobotrya. Farther on, we spotted a gray leafed tillandsia similar to T. ponderosa growing on the beaver tailed cactus. It is very hot and dry in this area. We then headed back towards Fortin via Route 150D and at about 5 miles past the Seperaza Road, at 9,500 feet, we collected beautiful specimens of T. violacea. We returned to our motel and cleaned our plants. Our tree climbers resting along the road. The author after a day's collecting. The following morning again met Domingo and set out on our quest for T. deppeana. Just 12 kilometers outside Huatusco we took a right turn and found T. ionantha, T. utriculata, T. tricolor, T. juncea, T. viridiflora, T. circinalis[? 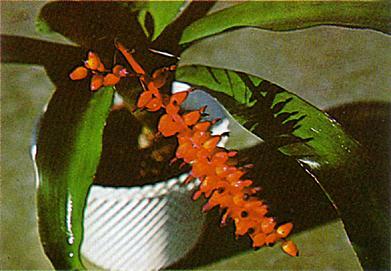 ], and Aechmea mexicana. At an elevation of approximately 3,500 feet, we found a very large tillandsia resembling T. ionantha, but it was too large to be this species. We speculated that it might be a natural hybrid. On our way home we saw T. multicaulis, T. deppeana, and T. lucida. The next day took us to an area south of Tehuacan and east of Teotitlan on the road to Huautla—a bad road and it is necessary to have a four-wheel drive to scale the mountain side. At 6,600 feet we found a small tillandsia which resembled T. califanii, with its long single light pink bract resembling a long graceful feather. We also saw the ever ubiquitous T. fasciculata and T. magnusiana, as well as what appeared to be T. prodigiosa and T. ponderosa, growing in with two orchids—Cattleya citrina and Laelia albida. Both T. califanii and T. utriculata grew on senilocerus cactus (old man cactus) as well as on the naolina plant. Out next venture was to Jalapa. On the way stopped at a very well-known nursery in Coatepec and saw many interesting orchids, bromels, and tropical plants. On Route 140 to Mexico City, at 7,000 feet we collected T. deppeana and T. violacea. On our way back at 4,800 feet on the road to Misantla, we saw many lush-growing T. multicaulis, T. punctulata. T. schiedeana, T. juncea and small orchid species. We were bound and determined to locate T. macdougallii, so the next morning again headed for Mexico City and some 80 kilometers outside the capital on the pay road at 10,000 feet found a number of beautiful specimens. 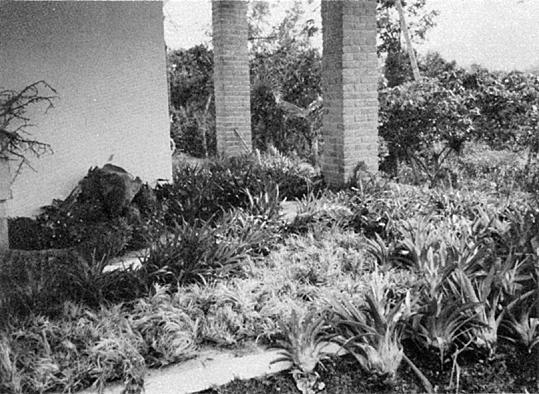 We made a number of sorties—one to Vera Cruz and another to the dam at Aleman, collecting various bromels, palm seedlings and several cycads. On our return a young Indian lad promised to get me several plants which he described as the most beautiful in all of Mexico. He said that they were so brilliant a red that they were used at Christmas time for floral decorations. 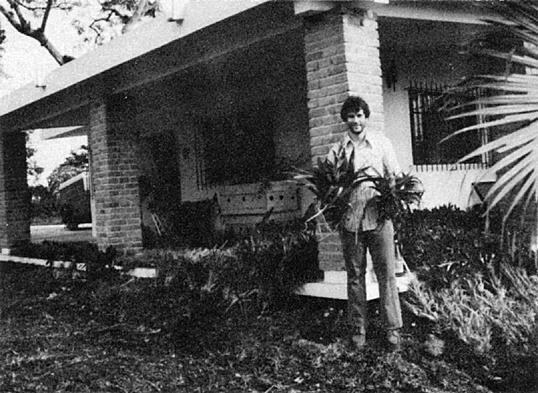 Not sure that the plant was, we had him collect a few, as he told us it was possible to get them only via a burro. The boy showed up the next day with a sack full of a very large form of T. imperialis—unfortunately all in flower with no signs of any pups. We paid him for his trouble, but the plants were of no value to us. On January 31, we headed for Taxco to try to locate T. intumescens. We engaged a young man to guide us to Ixcateopan and the grave of King Cuauhtemoc—some 36 kilometers from Taxco over a very bad dirt road. At approximately 7,000 feet we found what might be T. intumescens, but we could not be sure as there were no inflorescences. On February 2, we took off for Toluca and the Valle de Bravo. In the valley near a very large lake, we spotted T. bourgaei, T. prodigiosa—thousands of them. Also in evidence were T. macdougallii and T. violacea. Our route then took us through Morelia to Guadalajara and on to Mazatlan, where we stayed at the Motel SanLuis, an ideal spot for cleaning and dipping our plants. We boxed our plants and headed for Hermosillo and then on to Mexicali, where we were told we could go through agriculture inspection. But we found they were not equipped to do so, so we had to re-enter Mexico and head for Tijuana. It was quite a disturbing state of affairs to have to go back into Mexico with all those plants once again. However, we arrived in Tijuana and had all our plants inspected and the few cycads we collected had to be "gassed" for no reason at all. Apparently, a new inspector had not yet received the word that it was not necessary to do so. In Nicaragua we were entertained at a barbecue on an island in Lake Nicaragua. This is the largest lake in Central America—it is often mentioned as a possible route for another canal from the Pacific to the Atlantic. There are 314 islands and they dot the edges of the Lake like big cypress knees, small rocky humps with trees on them. Perhaps they are the knees of the two volcanoes that rise from the Lake to over 5300 and 4300 feet—an unusual sight. Our island rose steeply from the shore, so later when we sat on the terraces around the house we could look down on the dock and the launch we had come over on, with our lunch on the prow—two whole beef carcasses not long dead. From time to time we saw the cooks with machetes go down and slash off hunks of beef for the barbecue. The island was about 150 × 250 feet in size. Plenty of shade was provided by the largest mango trees I have ever seen, full of ripe fruit, much of it on the ground for the taking. The trees were all full of one kind of bromeliad, many at eye level. They were mats of curled and distorted silver tillandsias. I thought they must surely be T. caput-medusae, not knowing they don't exist near sea level. I picked up a branch from the ground that had a mat of plants and pulled a couple off to take with me. Half-inch red ants poured out and one bit me on the thumb. I had to pull it to bits to make it let go. Fortunately, the bite didn't last long and did not leave the usual ant welt. Ants are probably more of a hazard of collecting than snakes. Not long after I arrived home the plant bloomed having a short pink stalk with light blue flowers, and I decided it was T. circinnata. I know this is a native of Florida, but I have never seen one here, so I don't think it is very common, certainly not in Central Florida. Mrs. Sue Gardner of Corpus Christi, Texas, is an outstanding artist, her many fine drawings of bromeliads having been displayed throughout the country. Her latest showing will be at the up-coming International Exhibition to be staged by the Hunt Institute for Botanical Documentation, Carnegie-Mellon University in Pittsburgh from August 1976 to March 1977. 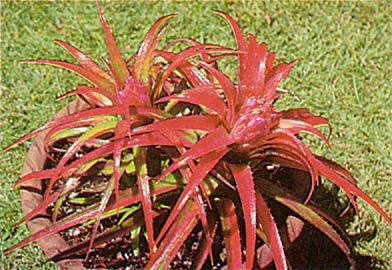 One of the most important elements in growing bromeliads is water. Most of us have been growing plants without worrying about water. Why worry about it now? I answer this question by saying, "I want to grow some of the problem plants and not have them die for me, I want my plants to mature without brown tips on the leaves, and I don't like the accumulation of salts around the base of the plants." These are the kinds of problems associated with high concentrations of dissolved salts in the water. When you decide to do something about watering, if you have a poor quality water, you can expect a definite improvement in growth, and this can be accomplished by a modest commitment on your part to spend a little more time when watering and a maximum of $5.00 for equipment. Beyond this a number of incremental improvements in growth may be achieved, limited only by your pocketbook and determination. Remember, good growing is good watering. The first rule is "never sprinkle." When you water, do a lot of it. Flood your bromeliads completely. Once a month, or even more frequently in the summer, after you finish watering all of your plants, go back in a half hour and do it again. The second rule is "acidify your water". To understand this, it is necessary to know about acidity, alkalinity, and the pH scale. A pH of 7.0 is neutral, pH above 7.0 is alkaline, and one below 7.0 is acid. For a change of one point in the pH scale the acidity or alkalinity changes by tenfold: i.e. pH 6.0 is ten times more acid than pH 7.0, and pH 5.0 is one hundred times more acid then pH 7.0. For diagnostic purposes, the pH value of the water is just as important to the grower as a blood analysis is to a doctor. A pH test kit may be purchased at any aquarium store where they sell tropical fish and tanks for use in the home. Such a test kit should be used to check the water you put in your plants after it is acidified. The easiest way to acidify water is to use a proportioner which injects a small amount of acid into the main water stream as you do your watering. A number of proportioners are available on the market. The method of use is the same in each instance. The acid solution is put in a container and a plastic tube from the proportioner brings the solution up for injection. One ounce dry measure of citric acid is sufficient in most instances to reduce the pH for 100 gal. of water by one point. One of the proportioners on the market is set for a ratio of 128 to 1. In this instance, dissolve one ounce of citric acid in one gallon of water and turn on the hose. Another one of the inexpensive and reliable proportioners has a ratio of 16 to 1. In this instance, dissolve one ounce of citric acid in one quart of water to prepare a stock solution. Four ounces of this stock solution in one gallon of water will be the amount for this proportioner. In those instances where smaller quantities of water are needed, 1/4 oz. of the above stock solution can be added to one gallon of water for direct use. In all instances, check the pH of the acidified water before you put it on your plants. The quantity of citric acid may be adjusted until the pH comes within the range of 6.5 to 5.5. Most water in the United States delivered to homes through the usual water mains has a pH above 7.0. This may be true even where the natural supply is acid, because the water company can save a considerable amount of money as a result of reduced pipe line replacement when they add calcium to the water to make it alkaline. The best way in any event is to call your local water company and ask for an analysis. When you receive this analysis, in addition to a pH value, you will find a list of elements and compounds in solution, together with a figure representing the total of dissolved solids in parts per million. The principal benefit from the use of acidified water is making nutrients available. For terrestrial bromeliads the pH value of the growing medium determines the availability of nutrients. NITROGEN, an important nutrient element, is adequately available to plants within a pH range of 6.0 to 8.0. PHOSPHORUS, one of the mineral elements, is needed in large amounts at least equal to the quantity of nitrogen. This is the nutrient for new growth, root development, and formation of seed. It is available only within a pH range of 6.5 and 7.5. At a pH below 6.0 the plant tends to grow leggy and weak, even with adequate light. POTASSIUM is the nutrient necessary for flower production, and to build resistance to disease and cold. A pH of 5.5 is about the limit on the acid side for plants to assimilate potassium in adequate quantities. SULFUR AND CALCIUM are essential elements for plant growth. Calcium is needed for cell wall and membrane construction. Sulfur is needed as one of the major components of some amino acids making up most proteins. These elements are available over a pH range of 6.0 to 8.0. MAGNESIUM AND IRON are instrumental in the formation of plant fiber. Magnesium is a structural component of the chlorophyll molecule, and is available in adequate quantities within a pH range of 6.0 to 8.5. Iron is not available in adequate quantities except in an extreme acid condition at a pH of 6.0 and lower. MANGANESE, BORON, COPPER, AND ZINC are essential trace elements present in most commercial fertilizers. They all require a pH of 6.5 or lower for assimilation. The potting mix will eventually have a pH the same as the water used. Each of the elements needed for nourishment by your bromeliads becomes unavailable outside of the listed pH values, being taken up and locked in by the organic material in the potting mix. The various components of the potting mix and their proportions are less important than the watering procedure. If the mix won't hold moisture, it may be necessary to water every day; on the other hand, an over-potted bromeliad with a heavy mix may not do well if it is watered more often than every 10 days or two weeks. Warm humid conditions promote rapid decomposition of debris. Required nutrients are available from the decomposition of debris. First rains wash a rich nutrient over all plants. During the growing season it rains about every day. Nitrates are exhausted first; phosphorus and potassium are the principal elements of nutrition at the end of the growing period and on into the dry season. Wet, shady situations tend to become acid. Dry, desert situations tend to become alkaline. In epiphytic bromeliads, the pH of the water in the tanks will change from time to time. These changes can be followed with a pH meter and may be of value in the determination of selective nutrient uptake at each life cycle phase. It is important that measurements be made the same time each day. Respiration will result in a change of CO2 concentration, and consequently pH values. It is also important to use pure water in preparation for tests of this type. Build-up of calcium and magnesium from most tap water will completely mask any meaningful pH change. Another complicating condition which should be avoided for testing purpose is the possible introduction of organic debris and its decomposition, which will make the water more acid. SEEDING PHASE: The demands of new growth and root structure exhaust the acid element of the nutrient supply much more rapidly than the other elements. The three principal fertilizer elements might be proportioned in the ratio: 1-4-2 (nitrogen, phosphorus, potassium). This ratio will insure an adequate acid balance. At this phase, however, the tanks are hardly large enough to hold sufficient water for a pH test. JUVENILE PHASE: In their native habitat, most tank broms at this phase have their tanks fairly well developed. Changes in the pH of the water can be followed very easily. Vegetative growth is accelerating. All of the nutrient elements, on the average over the yearly cycle, are required at about the same rate. At the end of the growing period each year, nitrogen is at its lowest ebb. At the beginning of the following year's growing period, however, nitrogen is again available to the plants in relatively large amounts. Normally, the pH of water in the bromeliad tanks during this phase is relatively stable. In their native habitat, this is assured by heavy and frequent rains during the growing period, and a minimum amount of nutrients in the tanks at the beginning of the dry season. MATURITY PHASE: This is the phase that starts when vegetative growth is complete and potassium is then taken up in increasing amounts. This is the phase crucial to success of the bloom. As potassium is being taken up by the plant, phosphorus is left in solution and the pH becomes increasingly acid. FLOWER PRODUCTION PHASE: This is the pay-off for everything that has gone before. Healthy stock with a proven superior inflorescence may fail to throw a good inflorescence if the preferred proportions and quantities of nutrients fell short of requirements during any of the previous phases. Very little if any nutrient is required or taken up during the flower production phase; therefore, pH tests will hold fairly constant between 6.0 and 7.0. Potassium stored in the leaves will flow into the inflorescence. After the final stage of flowering, phosphorus will again be taken up in an amount about twice as much as any other nutrient. SEED PRODUCTION PHASE: Nothing much will happen unless pollination took place. Nothing much will happen even if good pollination took place unless sufficient phosphorus rich nutrition is still available in the leaves. Most tank type bromeliads take up to a full year to mature their seed. The drain of stored nutrients necessary to mature a viable seed crop is such that production of vegetative juvenile growth is seriously hampered. 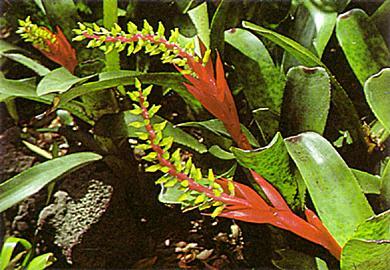 The drain of potassium during flower production, followed by the drain of phosphorus for seed production, will completely exhaust many of the less vigorous bromeliads. All dry-growing tillandsias, and most other epiphytic bromeliads have a very low metabolism level. In their native habitat, nutrient levels are usually much less than 50 parts per million. This means something less than 10% of the amount usually recommended on the package of commercial fertilizers. To exceed this amount may possibly cause conditions which inhibit the plant's ability to take up a specific element when needed. Failure of an inflorescence or a viable seed crop is not necessarily an indication of insufficient phosphorus or potassium, but possibly an excessive quantity of nitrogen. The one most important element for further consideration is, "What is the effect on the outlined changes if tap water is substituted for pure water?" CHANGES IN pH: With pure water, the most drastic change in pH is during the maturity phase when potassium is taken up, and the water in the tanks goes from acid to more acid. With tap water, concentrations of calcium and magnesium may completely submerge these effects and all tests are alkaline. CHANGES IN NUTRIENT ELEMENT CONCENTRATION: Further research is necessary in this area; however, a number of phenomenon relating to these problems are understood. These are principally associated with the ability of the plant to take up required nutrient elements. Some of the components of tap water may tend to inhibit a plant's ability to take up a particular required nutrient. One such situation is the taking up of sodium with or in preference to potassium under certain conditions. Many problems associated with the use of alkaline tap water may be minimized by acidifying it before use. Changing nutrient requirements from phase to phase during the life cycle of tank bromeliads points up the necessity of making changes in your feeding program. It becomes obvious that a feeding program is a must if you want prime quality plants. When your plants are actively growing, feed them with a balanced mix. When your plants begin to terminate vegetative growth, feed with a low nitrogen, high potassium mix. When your plants tend to become dormant, reduce quantity and frequency of feeding. Your feeding program should be designed giving due consideration to conditions as they exist in the bromeliad's native habitat. These conditions are: nutrient supply is very dilute and the bromeliad metabolism is very low. Total concentration of salts less than 350 parts per million. Percentage of sodium less than 30 parts per million. Boron less than 0.5 parts per million. Chlorides less than 5.5 parts per million. Sulfates less than 5.6 parts per million. Many of the high elevation bromeliads find even this concentration of salts intolerable. On the other hand, many bromeliads in cultivation have adapted and are able to tolerate concentrations in excess of the limits listed here. 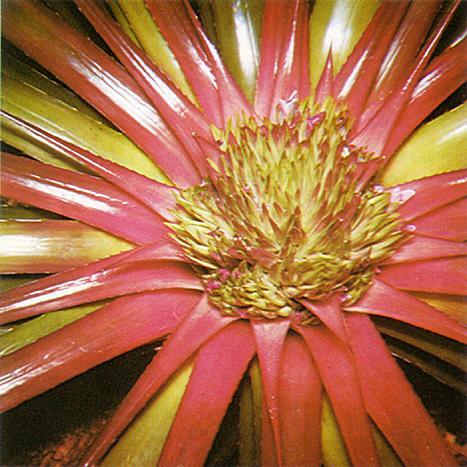 The full potential of many bromeliads can not be realized, however, unless total dissolved salts in the water supply is less than 50 parts per million. A tolerance for higher concentrations means growing and flowering, but usually marked by less than optimum growth, conformation, and color. Comparison of a water analysis from the water company with the above listed limits for bromeliads should be made. If your water supply falls short of these limits, you may be limited to growing the more robust, easy-to-grow bromeliads, or you may want to purify your water supply. The most practical method for purification is reverse osmosis. Systems are available from five gallons of pure water a day, on up to any required amount. The cost ranges from 2 or 3 cents a gallon on down to a few tenths of one cent, dependent on the quantity of water required. Reverse osmosis for the purification of water is a process based on the characteristics of certain materials which under pressure will allow water molecules to pass, but will reject molecules larger than that of water. Molecules of dissolved salts on the average range somewhat larger, and as a result about 90% of dissolved salts are eliminated. In most instances then, the pure water from reverse osmosis approaches the quality of rain water. The importance of pure water can be appreciated if one considers what happens to water in the tanks of bromeliads as evaporation takes place. When half of the water evaporates, the concentration of dissolved salts doubles. When ten percent of the water is left, the concentration has become ten times the original amount. If the water supply has a dissolved salt content of 300 to 400 parts per million, evaporation will bring the concentration up to the point where the salts will come out of solution and crystalize on the base of the plant. High humidity will slow down evaporation. Pure water will not build up to a high salt concentration between waterings, and heavy watering to entirely flush the plant tanks will help to insure achieving the full potential of your bromeliads. 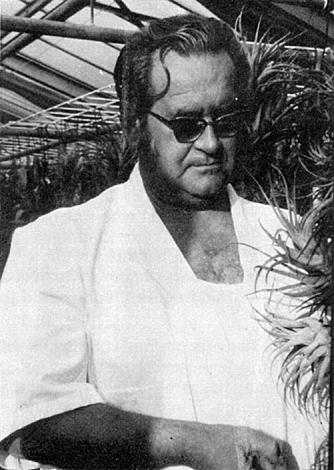 At the second meeting of the newly formed Bromeliad Society of Central Florida on November 1972, I was asked to say something to help launch the fledgling society. Nothing seemed more important than clarifying a few basic words which are so often misused. The name of this family (Bromeliaceae) is derived from a man's name Mr. Olof Bromelius, a Swedish botanist of the 17th century. We pronounce it with the accent on the EL — BROMEL. The IAD is the horticultural tag that says, simply, "belonging to". We can hope that this Society never uses the short, short abbreviation "brom" as they do in New Zealand, Australia, and elsewhere—it doesn't mean anything! The abbreviation BROMEL refers to Mr. Bromelius and is the core of our word bromeliad, so why not refer to our plants as bromels? Another word that should be clarified right from the start is GENUS. This refers to the family division such as Aechmea, Billbergia, Cryptanthus, etc. The plural form is genera, used when referring to a collective number of the division such as "Several genera live on rocks," or "Under the Bromelioideae division there are many genera," or "How many genera are represented in your collection?" One more word that needs to be clarified is SPECIES. The word is always used in its plural form. The second name of a plant, such as spectabilis, fasciata, recurvata is the species name. The word specie means money (Used more in colonial times when speaking of gold bullion.). Never use this word in connection with plants, although my husband reminds me that you need specie to buy species! Obviously "Bromeliad" is simply a shortening of the scientific name "Bromeliaceae" to indicate any member of the Pineapple family. We might call them all pineapples since they are members of that family, and not bother to find a new term. However, it would cause confusion to associate such diverse forms as the giant Puya and the Spanish Moss under a name for which we have already a sharp and narrow concept. As the Bromeliaceae were unknown before the discovery of America, we did not have any such ancient general term for the family as there was in the case of grasses, sedges, lilies, or orchids, and one had to be manufactured. It is not possible to say now who first coined the word "Bromeliad" but it was probably some fairly recent botanist or horticulturist who was tired of having to use the phrase "Species of Bromeliaceae" after the cumbrous and stately fashion of the old school. French and German botanists of the 19th century regularly used such single words for members of one family, had a standard way of making them, and seemed to find nothing undignified in the process. (Reprinted from Brom. Soc. Bull. Vol. I, No. 2, p. 11). When Alfred Blass, who maintains a remarkable tillandsia collection in a suburb of Munich, heard that I would be in his country, he wrote me an invitation to pay him a visit. About a year previous to my visit he had built a spacious new home and had erected as an adjoining addition a greenhouse which was so advanced in design as to be an outstanding model of engineering for the growing of tillandsias. In so doing, he has achieved the very high constant humidity so essential to the maximum success in growing certain tillandsias, along with proper light and warm day temperatures and devoted care. A wall of tillandsias in the greenhouse. 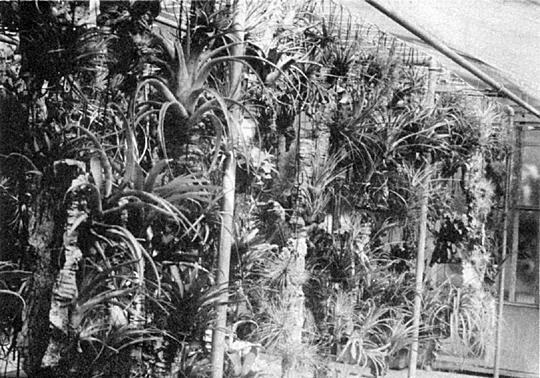 Alfred Blass's ambition is to have all the tillandsias available, and it would seem that he has more species and forms than any one else in the world. This is his hobby, and it would appear that he is succeeding in his ambition. When I was there he had between 300 and 350 species. Although collecting tillandsias is his hobby, his business is the growing and sale of aquatic plants. Directly from his home he can step into his great tank room, where a half-dozen employees and his son handle the shipments of aquatic plants to supply the great number of fish-tank owners in Germany. This moisture-laden big room is the open passageway to his greenhouse. It is to this tank-room that his "Tillandsiarum", as I might call it, is attached, supplying not only saturated moisture, but water as well to run into a large open reservoir built into the floor. I would say that there is nothing like it anywhere. Roof and sides are of plexiglass, making possible more light and better diffusion than light coming through glass. White walls reflect light. These factors produce ideal conditions for the general run of tillandsias, and the healthy look, vigor, and growth of Herr Blass's plants attest to the excellence of their environment. His greenhouse is 10 meters (33 1/3 feet) long and 10 meters wide. Down the center it is 4 meters (13 1/3 feet) to the apex of the roof. The roof slants to the sides and is 2 meters (6 2/3 feet) above the side walls. The roof consists of lengthwise movable slats and can be set automatically or operated manually to close completely or be adjusted to any angle. To prevent excessive light at peak periods of sunlight, a great sheet of mesh screen is attached below the roof, and this can be manipulated manually by cranks to fold completely or to any less degree. There is a large ventilator to assure air circulation. Early each morning Herr Blass hoses down the floor of the greenhouse and sprays profusely each evening with pure (dechemicalized) water during good growing weather. Winters are dull and afford little good light, and it is then that the plants are sprayed but once a week. The plants are suspended on a series of steel racks. There are five of these 6-foot high racks, and access is afforded on both sides of each rack, making ten rows that one can saunter along. The specimens are fastened to slabs, one or more to a slab. Two or three of these chunks are hooked one to the other in a downward line. A slab can easily be lifted off and replaced for examination, photographing, or changing its location. Nearly every plant has a tiny information tag attached giving its name and code of accession. Thus Herr Blass can see at a glance name, location data, supplier, date, accessions number, and possibly a descriptive note. This rack arrangement with the trick of hooking one slab on top of another permits the placing of many tillandsias in a limited space without the overcrowding many other plants would assume, and also permits access to light and air circulation. The plants are grown indoors the year round. The amount of heat needed in the winter is small, since much heat comes from the adjoining tank room. Herr Blass has been interested in tillandsias for the past eleven years. He became involved in this genus when he was making a study of growing orchids on cork and grape vine. Outstanding among the tillandsias in bloom during my visit were T. brachycaulos, T. disticha, T. edithiae (see Journal for March-April, 1975), T.meridionalis, T. micans, T. monadelpha, T. paleacea, and T. appariciana. It is time to think about selecting plants for the spring shows and getting these into presentable condition. The minimum touch-ups that most of us do throughout the year are usually insufficient for public display and a judge's close scrutiny. Merely removing dead leaves is not enough. The finesses beyond that point can make the difference between an attractive plant and a real prize winner. About two days before the show select plants that have definite possibilities of becoming eye catchers, but do not overlook something simply because it looks a bit shabby. Much of that shabbiness will disappear in the grooming process. Remove any dead or nearly dead leaves at the base of the plant. If these leaves do not come loose with a gentle tug, split them in half beginning at the tip and spread the two halves completely to the base. Continue the direction of the pull, and you will find that the leaf halves then separate from the base of the plant easily. (Be careful not to damage any budding offshoots.) If you still have enough of a plant left to work with, look then at the leaf tips. Brown tips may be trimmed away with a good, sharp scissors. In performing the trimming, shape the new leaf end to match the original tip. If a leaf has a brown spot half way down its length, you may feel compelled to remove the leaf completely. Try trimming it first. A well trimmed leaf will find the approval of most judges and will last for several days before needing more attention. Next consider the necessary cleaning of the leaves. We should strive to remove all foreign matter from the leaves and the tank—dust, dirt particles, pine needles, insects, lizards, etc. (I once found a snake in one of mine). Use soft, long handled paint brushes, handkerchief sized pieces of soft cloth, and chop-sticks for tools. It is important to avoid breaking a leaf or rubbing it so hard that it is bruised. Hold the plant upside down while squirting it with a medium strong spray from the hose. Light infestations of mealy bug or aphids can be removed with the hose and a soft brush, but there is little hope of removing scale without the damage showing. Rub stubborn dirt spots gently with a soft cloth. Do not neglect the underside of the leaf. The pot must also be in prime condition. If the pot is cracked or chipped, select a new one. If the pot is out of proportion to the plant choose a more proper size. Unbroken plastic pots are easily cleaned with a damp cloth. Clay pots require more attention. First remove the plant from the pot and lay it aside. Hold the clay pot under running water and scrub it with a teflonized or plastic scouring pad. Do not use steel wool pads because they will leave black marks. Remove all signs of dirt and whitish mineral deposits. Heavy deposits may require soaking the pot in water for several hours, and very bad encrustations have probably damaged the pot's surface beyond help. It your efforts seem to have been successful, return the plant to the pot and press new soil around the roots to assure a firm positioning. The soil surface may also be dressed with fresh soil, but do not use decorative rock, marbles, plastic chips, etc., because such glamour is usually forbidden in the shows. By now the water on your plant's leaves has probably dried and left ghastly whitish spots. This problem is solved by dipping a clean, soft cloth into rain water or distilled water and wiping the surface of each leaf. Now you are ready for the final polishing (if desired). Shows generally do permit the use of leaf polish, but check the particular show regulations before performing this final step. Several products are available to put a finish on the leaves that can range from a dull gloss to a super-shiny glare. You may prefer the soft glow given to the leaves by the product called Poly-Trap. This product has the distinct advantage of also protecting your plant against dehydration and certain chewing insects. The high gloss afforded by other products may be tempered by diluting the solution with rain water or distilled water before applying it to the plant. Experiment on a non-show plant until you achieve the desired degree of shine. To avoid sticky, irregular spots, make sure that these latter solutions do not sit in pools or droplets on the leaf surface. When the polish has dried, you are ready to cart the plant (properly labeled, of course,) to the show. And the best of luck to you! It is indeed surprising that this very handsome Ecuadorian native has been overlooked by collectors, for it grows in locations that are favorite haunts for the bromeliad hunter. Outstanding is its large red and yellow inflorescence, which lasts in color for over a month, and which certainly would attract any plantsman on the lookout for a stunning plant. It is a terrestrial, growing at elevations of approximately 6,000 feet and has been found on road-cuts on the Guayaquil-El Tambo road. The plant is over three feet tall, with a well-developed woody base, from which comes numerous fibrous roots. 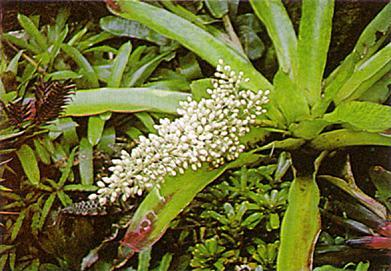 The leaves are up to two feet in length, and the inflorescence reaches a height of up to 20 inches. The floral bracts are bright red; the petals a brilliant yellow. Apartment growers will do well to differentiate between the dry-growing tillandsias whose leaves are well covered with white or grey trichome scurf and the softer leaved tillandsias without much lepidosity. The dry-growing plants can be grown bareroot, epiphytically on cork bark, tree fern, or driftwood. If they are properly secured and receive sufficient moisture, they will produce roots, flourish, and ultimately flower. One or two 10-minute soaks per week in a tub or the sink are especially helpful. However, these plants should be inverted after soaking and the excess water drained from the leaf axils. The lepidote tillandsias rely upon their trichomes to absorb moisture and many will tend to rot if water is held in the leaves over too long a time. The softer leaved tillandsias such as T. flabellata or leiboldiana, however, will not do well epiphytically unless you maintain quite high humidity in your apartment. As their leaves do not have much trichome cell covering, they cannot absorb much moisture or nutrient from the air and they are best grown potted in a porous, well-drained mix in which they will produce feeding as well as gripping roots. Some of the soft-leaved plants can retain and feed from water in their leaf axils. Mounting tillandsias on slabs of fern or ponga as well as cork bark seems to be the most beneficial culture one can devise. A point of clarification should be inserted when speaking of tillandsias and this is 'gray' leaf tillandsias such as T. streptophylla and T. cacticola. 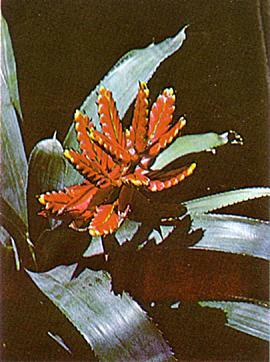 As very few of these bromeliads have a water reservoir, they must take the bulk of moisture and nutriment from the air. Many Houston members and Corpus Christi members are finding that these particular plants rot or die if potted. There are multitudes of ways to mount tillandsias but the easiest and surest way is to glue them on. The 'tools' are simple; a tube of DuPont silicon clear glue, some strips of nylon hose cut into 1" wide and 4" to 5" strips, slabs of fern or cork bark and of course a few tillandsias. Dab a small amount of glue to the slab, enough to cover the base or root area of the plant to be used. Press gently plant to slab and hold with one hand and tie the nylon hose around the plant and slab with the other hand until secure. Let the glue dry overnight for best results and then remove the nylon hose. Hang the plant high in the green or lath house where it will receive the best light and air flow. In Texas and other Gulf Coast states, precaution should be taken when watering, especially those tillandsias with soft gray leaves as they have been found to have little resistance against rot once it sets in. If the plants are well aired and receive good light, they need almost no watering. Let nature bathe them with fog and gentle rains. If in the greenhouse, the leaves of the plants can be misted once every two weeks. If the culture you are currently giving your plant is one which the plant enjoys, continue its use and do not change. As many bromeliad growers know, here in central Florida we can grow bromeliads very successfully out of doors. The forests drip with Spanish Moss (Tillandsia usneoides) and Ball Moss (Tillandsia recurvata). In damp woods and low swampy areas and stream bottoms we find Tillandsia utriculata, T. valenzuelana, T. fasciculata and variations, T. simulata, T. bartramii complex, T. setacea and variations, T. balbisiana, and others, possibly hybrids of these. In November, December, January and February, we are apt to have frosts and freezes. Because of this many members of the Central Florida Bromeliad Society have greenhouses. They live in the counties surrounding Orlando—Orange, Lake, Osceola, Seminole, Brevard and Volusia. Once, in December 1962 our thermometer fell to 16°. This was the year so much citrus was killed. Many of our trees were killed to the ground and some were killed outright. In many places the wild bromeliads disappeared forever; the Spanish Moss turned black but recovered. The few T. utriculata we had growing naturally were killed. We did not have any other bromeliads then, except the mosses. We have not had bromeliad-killing frosts in the past two years, the temperature in our grove, not far from our house, has fallen to 32° or below about 15 times, and to 25° five times. Some of our vegetables have been killed each time. Our house is in woods next to the grove, a mix of live and deciduous oaks, and tall longleaf pines—all full of Spanish and Ball Moss. We have planted many other kinds of pines, palms, hundreds of camellias, azaleas, and other trees and shrubs in these woods. So the bromeliads are rather protected around the terraces and among the shrubs and hanging from the trees. Those not planted in the ground are usually moved into our 12 × 20 fiberglass house from November 15 to February 15. The rest of the year it stands empty of plants as the temperature gets to 120° or so inside; perhaps the bromeliads could take it, but I can't, and now that electric bills have doubled neither can my pocketbook. Before we had a greenhouse or so many bromeliads, I covered them with layers of Spanish Moss and newspapers on nights when freezes were predicted. In that period I lost very few plants, just a couple of cryptanthus, vriesea, and a bit of T. ionantha. Some others looked bad but came back. My permanent outdoor bromeliads, other than tillandsias, are planted in the ground or in crotches of trees and on lower trunks. Those fastened to trees are limited to tillandsias, aechmeas, billbergias and neoregelias. The tillandsias now seed themselves all about the place, some with my help. I gather the seeds and press them onto the rough bark. On their own they favor the camellia brushes and when they get big enough I move them. Aechmea—angustifolia, bracteata, bromeliifolia, calyculata, cylindrata, micrantha, × 'Foster's Favorite' (it yellows even with moss on it) distichantha schlumbergeri, lamarchei, mexicana. Billbergias—distachia varieties, nutans, pyramidalis (yellows in open), pyramidalis var. striata, vittata green phase winter blooming, and other hybrids (no name). Portea petropolitana var. extensa seedlings. In the town of Mount Dora there is a cabbage palm in the center of a lawn whose trunk is completely covered with the narrow-leaf type of Billbergia nutans from the ground way up to the crown of fronds. It is covered with bloom every year, quite a sight to a bromeliad fancier. If ever it has been frost damaged, it is not apparent from the street. Spanish Moss, Tillandsia usneoides, gets damaged in very hard freezes and I think this is the cause of the "mysterious disease" that many people have been writing about in the past few years. (I think they are too young to have seen what has happened to it in past freezes). Perhaps the pollution in cities has also helped to blacken it; also most towns spray from time to time with copper sprays to kill it. I have noticed that the moss close to the house is thick as ever. I used to carry bags of it up to North Carolina to hang in our trees when we lived up there and it would last several years until a really hard freeze, then I'd have to replace it. It is a native of Eastern North Carolina. Glenna Simmons, Mt. Dora. Florida 32757. The Bromeliad Society has shown tremendous growth over the past year. Approximately one thousand new members have joined the society during this period. With increased members there are greater possibilities of meeting other bromeliad growers in a given area. A combination of a mutual interest in bromeliads and a continuing interest in the desire to know more about them soon creates an atmosphere of wanting to meet other enthusiasts and 'talk shop'. There is great enjoyment to be derived by meeting other bromeliad growers and to share and exchange ideas. Starting an affiliate of the Bromeliad Society is a simple procedure. Under the current By-laws only three members are needed to form an affiliate. For assistance, please contact Thelma O'Reilly, Director of Affiliates, 10942 Sunray Place, La Mesa, California 92041. She will send you a list of members residing in your area, the necessary information needed to form an affiliate and how to obtain a charter. Additional information will be supplied on a suggested constitution and by-laws, publicity and suggestions for programs. All this information will make it easy to form an affiliate, and you will soon be enjoying the association of other bromeliad fanciers and acquiring their knowledge of success and failure as well as possible remedies. Some affiliates have started their own newsletters which give much cultural information for a particular locality plus general information important to successfully growing bromeliads. For those of you who live in more isolated areas where there are not enough members to form an affiliate, you can still have a personal touch with other bromeliad enthusiasts by joining a Round Robin. If you are interested please write to Velva Jane Watson, Director of Round Robins, 8615 Jackson Springs Road, Tampa, Florida 33615, for further information. This beautiful bigeneric hybrid, a cross between Neoregelia bahiana var. viridis and Orthophytum navioides, was made by Mulford Foster and named in honor of Dr. Lyman B. Smith. 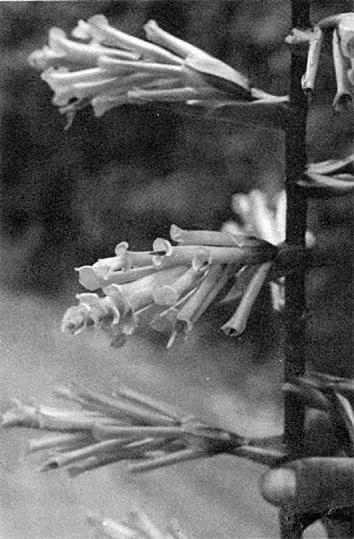 The cross was first described in the September—October, 1958 Bromeliad Society Bulletin. In every way it takes on the appearance of the seed parent, Orthophytum navioides, except that at flowering time only the center turns red, whereas the parent plant turns completely crimson. At maturity the hybrid has a spread of about 18 inches, but is only 4 to 5 inches in height. In southern California the plant may be grown outside, although it attains a larger size when kept in the greenhouse. It retains its central coloring for a considerable period.